The eighteenth International Conference on Difference Equations and Applications will be held in Barcelona (Catalonia, Spain) from July 23 to 27, 2012. 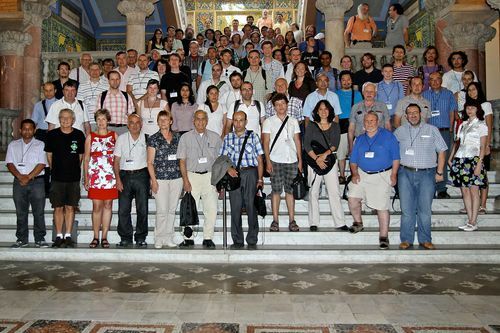 The conference is organized by the Department of Mathematics of the Universitat Autònoma de Barcelona (UAB), under the auspices of the International Society of Difference Equations (ISDE). The previous conferences were held in the cities of Trois-Rivières (Quebec, Canada) in 2011, Riga (Latvia) in 2010, Estoril (Portugal) in 2009, Istanbul (Turkey) in 2008, Lisbon (Portugal) in 2007, Kyoto (Japan) in 2006, Munich (Germany) in 2005, Los Angeles (California, USA) in 2004, Brno (Czech Republic) in 2003, Changsha (China) in 2002, Augsburg (Germany) in 2001, Temuco (Chile) in 2000, Poznan (Poland) in 1998, Taipei (Taiwan) in 1997, Veszprém (Hungary) in 1995 and San Antonio (Texas, USA) in 1994. The purpose of the conference is to bring together experts and novices in the theory and applications of difference equations and discrete dynamical systems. The main theme of the meeting will be the interplay between difference equations and Dynamical Systems. The plenary speakers are experts chosen from the many areas of Difference Equations, broadly defined, and experts on Discrete Dynamical Systems and their interplay with nonlinear science. Contributed talks in this field are welcome and will be considered. The conference will also have few special sessions on concrete themes of Difference Equations and Discrete Dynamical Systems and their applications. There will be proceedings of the conference. They will be published in a special volume of the series Springer Proceedings in Mathematics entitled Discrete dynamical systems and applications that will be edited by Lluís Alsedà, Jim Cushing, Saber Elaydi and Alberto Pinto. All participants are cordially invited to submit a survey paper to this volume.